The rain is atmospheric, and I was glad it was there for my first playthrough ... but now that I've started the game a dozen times, I'm tired of it, and I just want nice weather. 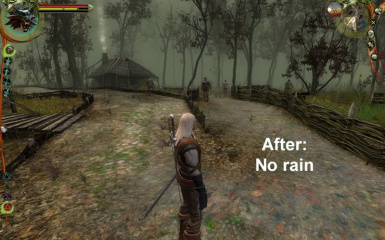 This mod will give Geralt a scroll -- to be found in his quest inventory, so it doesn't take up a slot in his bag -- that will force the rain to stop when Geralt reads it. These files should be placed in your Override folder; if you don't have an Override folder, you can just make one. It goes in your The Witcher Enhanced Edition\Data folder. 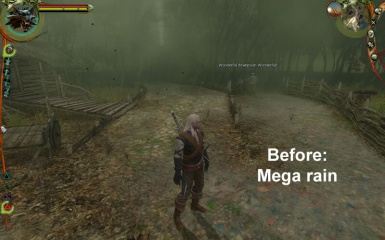 The def_arealoaded.ncs script is from J_Slash (who made the Stuff That Makes Geralt's Life Easier mod). The custom_script files are my adaptations of his custom script, so full credit to J_Slash for both of those. The def_arealoaded script can conflict with other mods. But all it and the custom_script files do is give Geralt the stop-the-rain scroll, so once Geralt has that scroll, you can take those files out of your Override folder. 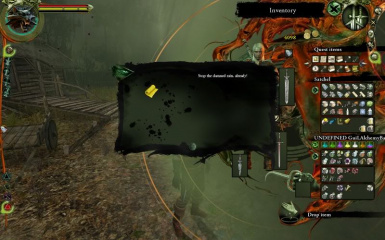 If you want to use this with J_Slash's Stuff That Makes Geralt's Life Easier mod, all you need to do to put one of them in your Override folder, start the game, and wait until Geralt has been given the item(s). Then save and exit the game and add the second mod to the same folder as the first. The custom_script for the second mod will overwrite the first one in your Override folder, but that's okay, because you already have the item(s) from the first mod. Start your game up again, wait a few seconds, and you should get the second item(s) added.